After a career as a screenwriter, Alex Garland's directorial debut Ex Machina amazed and astounded audiences in a way few sci-fi movies have done in recent years. Not only did it win an Oscar for Best Visual Effects (and give us that awesome Oscar Isaac dance number), but it set Garland as a filmmaker to keep a close eye on. That's made the wait for his followup, a starry adaptation of Jeff Vandermeer's sci-fi novel Annihilation, almost unbearable as we've seen precious little from it. Well now that has changed with the first look at star Natalie Portman in a scene that is already creepy. The story, the first in Vandermeer's trilogy, follows four female scientists sent into a quarantined environmental disaster zone known as "Area X" to investigate abnormal activity. They're the 12th expedition sent in by a mysterious corporation, with all of the other attempts ending tragically. 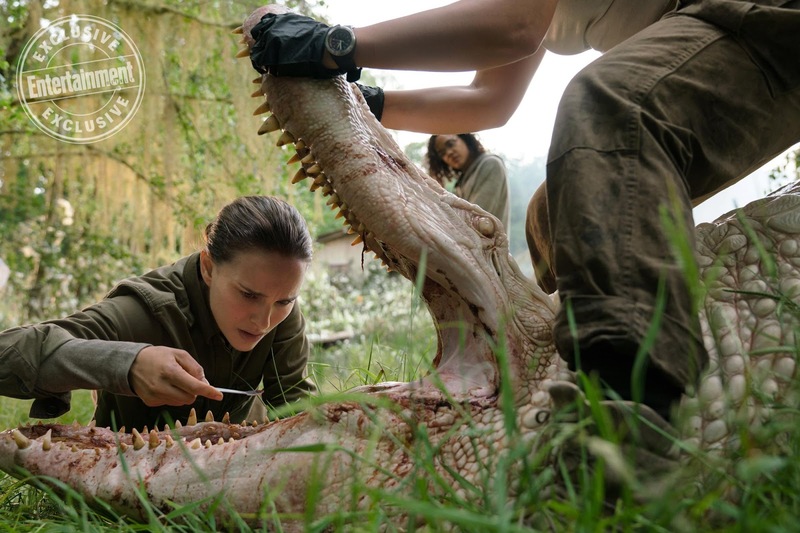 The image shows Portman as Lena (the book's characters have no names) investigating an odd-looking alligator. The film also stars Tessa Thompson, Gina Rodriguez, Jennifer Jason Leigh, and Oscar Isaac. Annihilation opens February 23rd 2018.